As part of our continuing coverage in anticipation of the release of Cars 2, today we have our exclusive interview with story supervisor Nathan Stanton. A Pixar mainstay for 15 years, Stanton has worked as a story artist on A Bug’s Life, Toy Story 2, Monsters Inc., and Finding Nemo. For Cars 2, Stanton acted as the story supervisor. During our interview, he talked about what being a story supervisor at Pixar entails, what films influenced Cars 2, the challenge of finding the heart of the story, how Paul Newman’s passing affected the film, and what Pixar’s research trip to Europe was like. If you’re interested in getting a behind-the-scenes look at how the creative process at Pixar works, you’ll definitely enjoy this interview. Hit the jump to check out what Stanton had to say. Cars 2 hits theaters on June 24th. During our interview, it became clear just how invested Pixar is in story. They will do whatever it takes, for however long they need to, in order to ensure that they’re telling the best story possible. Stanton was extremely gracious in his answers, giving an inside look into how the creative process at Pixar works. I’ve always been interested in learning how it is that Pixar maintains their practically impeccable track record of producing incredible material time and time again, and talking with Stanton was like getting a tiny peek behind the curtain. Beware, SPOILERS ABOUND regarding the overall plot of Cars 2. If you want to go into the movie fresh you might want to check the interview out after you see it. As story supervisor, his job is to supervise all the storyboard people in the Story department over the course of a project. He looks at all the sequences the story team creates and gives notes, working closely with the director. He came on to Cars 2 at the beginning, after co-director Brad Lewis and the screenwriter had been working together for a few months. He starts by helping them flesh out the story on boards, then begins to assemble the crew for the film. Some of the specific influences for the film were Ronin, Road Warrior, North By Northwest, Marathon Man, and Innerspace. He did frame grabs for Ronin, examining how chase scenes were shot. A lot of what they’re looking at is tone, and how different filmmakers approached similar situations. 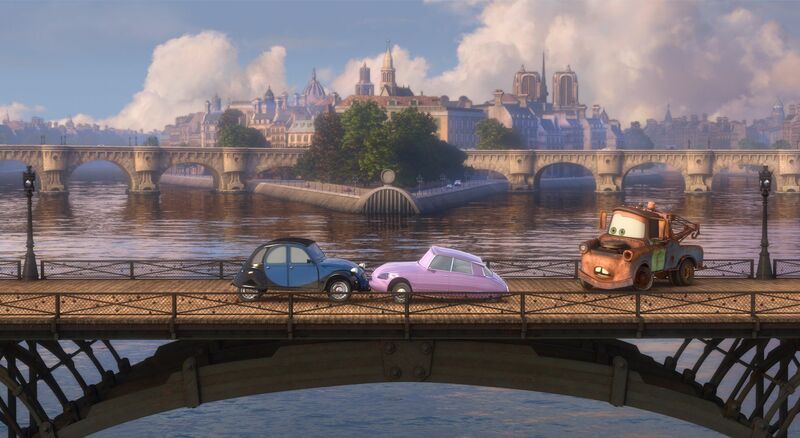 The team had a hard time finding the emotional center of Cars 2 for a while. 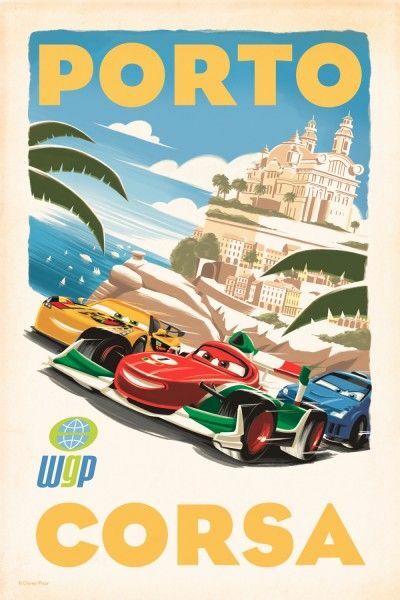 They decided to focus on the friendship between Mater and Lightning McQueen, and how that friendship is tested while they’re traveling the world. They knew they wanted Michael Caine in the movie early on. They always described the character as Francesco as similar to John Turturro in The Big Lebowski, then they actually cast John Turturro in the part. Paul Newman’s character was originally in the film, but after he passed away they had to decide whether to recast or remove his character from the film entirely. After much deliberation, they decided to remove his character from the film. They tinkered with the idea of having Newman’s character’s loss as the emotional center to the story. They would explore how the loss of a father figure affected McQueen and Mater, but they ultimately couldn’t get it to work and abandoned the idea. The biggest challenge on Cars 2 was the scope of the story. They struggled with how complex and complicated it was. The art department also had a difficult time designing the world because it was so intricate and large, and they went to so many places. He was part of the creative team that took a research trip to Europe. They visited 15 cities in 12 days. They spoke to someone from Scotland Yard, rented cars and cruised Germany’s Black Forest, and watched an F1 race in Monte Carlo. 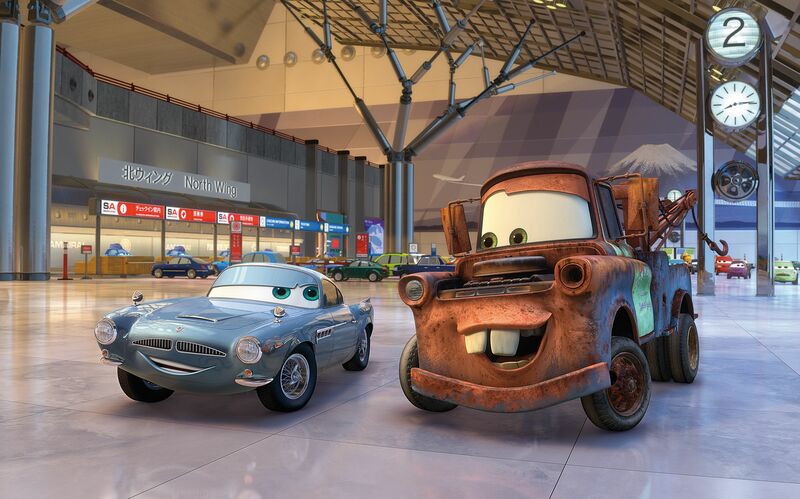 There are three basic storylines in Cars 2: the friendship between Mater and McQueen and how that’s tested, Miles Axlerod’s story, and the spy-thriller story that Mater’s wrapped up in. They tried to balance the three stories as best they could, and spent many screenings tinkering with how much of each storyline was included in the film. Collider: I was wondering if you could talk a little about what the title of “Story Supervisor” entails here at Pixar? Nathan Stanton: Yeah I’ve been here at Pixar for about 15 years, and I’ve storyboarded on 7 films, but the head of story for Cars 2 is the first time I’ve done that. Basically that’s the guy that sort of supervises the other storyboard people, and there’s anywhere from 6-10 people in a storyboard group for each film, and they tend to be on the film for anywhere from 2-3 years, sometimes longer. So I’m not so much storyboarding per se, but I’m looking at all the sequences that those story people are doing, and then I’m giving notes and the director is looking at all of their sequences. When I get pages I’ll look at them and make sure and think “Okay this one guy happens to be really good at subtle acting, I’ll give him this scene. This guy’s really good at action.” That’s kind of how you would break it down. But then my job is to sort of keep track of the whole movie as it’s changing, because it’s always changing, and then keep my team informed about what’s going on and keep them moving. If there’s a separate meeting, which happens a lot, with just the director and the writer and we’re talking about the movie and the changes that need to be made, I’ll be the one in that room. So that’s kind of what it is. So on Cars 2, did you come in at the inception of the project? Stanton: Yes, well at the very beginning it was (co-director) Brad Lewis and the writer, and they were on the movie for I think a few months, if not like 6 or 7 before I came on. And then I came on and helped them start doing beat boards, which is just sort of—you’re visualizing each scene in sort of one drawing, and it’s a great way to flesh out your movie and get a sense for what it’s gonna be. And then I started looking at people within the building, “Okay this is who I think I want on my crew,” and we gotta have a couple of people who we know worked on the first movie, so I was lucky enough to get two guys that worked on the first movie. And then you flesh out your crew with kind of whoever’s available really, and the other folks. So I would be the first person that would come on, and then Harley Jessup who was the production designer, he came on pretty soon after me. And then he starts designing the world, and then there’s a lot of back and forth, and that’s how it begins. I know you guys watch a lot of different movies to prepare. What were some of the specific influences on Cars 2, and how early does that start? Do you not want to cloud or muddle your own ideas? Stanton: Well, you wanna get as much reference as you can. And we all love movies, in the story department most people love to watch movies and I watch as much as I can, you’re influenced by everything. One of the first things I did was look at Ronin, I did frame grabs for several scenes in the movie and actually filled up a couple of boards with just shots in the movie, just to get an idea of “how were they using the camera in all these car chases?” Because I knew we were gonna have a lot of car chases in this movie beyond the racing. Road Warrior is another one of my favorites, so I looked at that, sort of looked at how they used the camera and again started looking at films, more of the spy or conspiracy-thriller wagon, you know North by Northwest was a big influence, you have a character who’s mistaken for somebody else. We love the tone of Marathon Man, it’s very creepy and so we looked at that often. As funny as it sounds, Innerspace which is a very silly movie, but the concept is the same: something is injected into someone and he has no idea, he’s unaware of it. So we were just looking at those films, saying “Okay how did this filmmaker deal with this scenario? Oh okay that’s interesting, how did this filmmaker deal with that?” But a lot of it is just tone. Tonally, how are we able to get this film across? Because you wanna get that on the boards as soon as you can. Pixar films have this gut-crushing emotionality to them. What would you say is the emotional center or the emotional grounding of Cars 2? Stanton: Well for this movie, it took a long time to get. We had a really hard time finding it. We really started focusing on the friendship of Mater and McQueen, and we realized “Yeah these guys are best friends.” And we looked at the timeline of when Cars was released, 2006, and where we are now and we thought, “Okay, in reality it’s about four years later, they’re probably still best friends, McQueen is still racing but this is his best friend and these guys get along great, they trust each other.” But then we started thinking about, “Okay think about what we’re doing with this movie, these characters are leaving Radiator Springs and going to all these European locations and Japan,” and we thought “Well what happens with that friendship? They trust each other and McQueen’s like yeah he’s my best friend, but in Radiator Springs. What happens when they leave that comfort zone?” So we loved exploring that idea. Are you guys thinking about voice casting during the inception phase and breaking the story, or do you want to wait until you have the characters fleshed out before you begin thinking about actors? Stanton: It’s a little bit of both. There’s definitely instances where it’s like “Oh we really wanna get this guy, he would be great,” and often you write for that actor or actress. For this movie, there was a little bit of both. I knew that we had really wanted Michael Caine, and luckily enough we got him so that was great. And then our Francesco character we really talked about often, “It’s like that character John Turturro plays in The Big Lebowski,” and then when we got him it was like “Wow that’s great, we never thought we’d get that guy!” So we have lists, the story department will come up with our own lists, but there’s a casting department here that sort of focuses on that stuff. They often will come to the director and say “Here’s how we suggest, and who we think we can get.” But if a director really wants someone, they’re gonna try their hardest to get that person. I’m sure the passing of Paul Newman was upsetting. Was his character originally part of the film? Stanton: Yeah, definitely. It was definitely a touchy subject and it was really difficult waters to navigate, how do we properly do that? We had found someone else to do the voice for Filmore (George Carlin’s character), and that’s worked out pretty well, it’s the person that does the voice for him in the Cars Toons. But we felt, after really tooling around with the idea of him being in the film and how do we properly use him, it just felt right that we should have his character have passed away also. And he is a bit of a father figure for both these guys. That is something we explored quite a bit actually as the emotionally throughline, we just could never make it work, was the loss of this father figure and how it affected Mater and McQueen. We ultimately sort of abandoned it, just to focus on their friendship. Each Pixar film seems like it keeps getting better and better. What do you see as the future? What’s the next frontier? Stanton: You know with every film they end up doing something they haven’t been able to do before. I think it’s kind of endless, you know? The hardest thing now is that there’s so many other studios making animated films, so you never wanna do something that somebody else has done. And that does happen, where you think, “Oh shoot, it’s too bad those guys did that because we really wanted to make a movie about that,” whatever it is, but they might not have done it great or they did it amazing and you just don’t wanna copy that. So I have no idea what the future will be, I know that there are two other projects that are in the works right now that I can’t really talk about, but I think that they’re both gonna explore things that we haven’t done, which is really exciting. I’m always amazed with what they do here, with every movie. What was the biggest challenge you faced when working on Cars 2? Stanton: I think just the scope of the story, I know specifically in Story we struggled with how complex this movie was. It was very complicated, and we kept on struggling with every screening trying to make it work, and we didn’t have much heart in it for a long time. Just the plot alone was too complex, so it took a long time to slowly but surely strip all these variables away to finally find the plot and the conspiracy, and get the heart. That really was the hardest thing. I know in scope for the production and specifically for the art department, designing the world was incredibly difficult, because we went to so many places and it was just amazing. John (Lasseter) loves to sort of car-ify as much as we can, and that’s the universe these characters live in, so that was really difficult. I know all of that was. I think the amount of sets might have been, production-wise, it was very difficult. There were almost 200 sets, and that’s a lot. There was a lot of sets, a lot of crowds. But I know, in my world of Story, it was just getting this thing to work. It was very difficult. Stanton: Oh almost everything. We went to 15 places in 12 days, and it was just a whirlwind and I loved every second of it. But anywhere you looked it was like “Oh look at that cool thing!” You know I was the one lone story person there, which was great because I could talk to these guys about what we were doing, and the movie was constantly changing even while we were there, and after. But everything that you saw, you tried to look at the cars that were specifically in this world, and the architecture. We met with someone from Scotland Yard in London. And then in Germany we rented cars and drove through the Black Forest, we were gonna have a race in the Black Forest which we ultimately had to cut out. So that was really cool, just being in that environment. And then we went to the F1 races in Monte Carlo, which was really exciting because every one of the races were in city streets, it was really exciting just to hear what it would sound like and see how the stands were set up, and look at the pit building. So every place we went to influenced something about the movie definitely. From the footage we saw today it looks like the film is definitely part spy-thriller, part racing film. Is there a separate throughline for McQueen’s racing storyline or does the spy-thriller aspect permeate throughout his story as well? Stanton: Well there’s three things going on. You have the friendship of Mater and McQueen, which becomes broken. Then you have the racing, the World Grand Prix is a whole other level of stuff going on, you have Miles Axlerod and his story. And then you have the spy conspiracy, so those three main components is really all the things that are going on. And again it was really difficult to make sure that all of those worked, and with every screening we struggled it was “Oh there’s a little bit too much of this, okay we gotta tone that down. Now there’s a little too much racing and not enough conspiracy.” It was constant battle to find the right line for all three of those things to work.